The Routledge Language Family series is aimed at undergraduates and postgraduates of linguistics and language, and those with an interest in historical linguistics, linguistic anthropology and language development. According to a widely accepted hypothesis, the Khoesan languages represent the smallest of the four language phyla in Africa, geographically distributed mainly in Botswana and Namibia. Today, only 30 or so Khoesan languages may still exist, with about 300,000 native speakers. In other words, most Khoesan languages were already extinct before a sound scholarly interest in them could begin to develop. Drawing together a distinguished group of international experts, with much of the material taken from data collected by the authors’ own field work, this volume presents descriptive, typological, historical-comparative and sociolinguistic material on Khoesan. 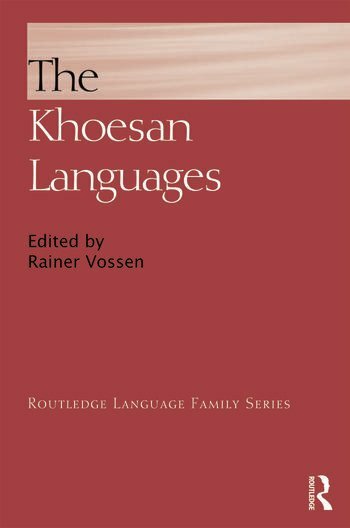 The Khoesan Languages contains eight sections: an introduction, an overview of genetic relationships, a typological survey and profile of Khoesan, four chapters covering core linguistic areas of Khoesan phonetics and phonology, tonology, morphology and syntax, and a final chapter tackling major issues in Khoesan sociolinguistics, as well as discussions of language contact. Comprehensive and scholarly, yet also lucid in its coverage of a broad range of languages, dialects and sub-groups, this unprecedented and original work represents the current state of Khoesan linguistics. Rainer Vossen is a University Professor and Executive Director of the Institute of African Studies at the University of Frankfurt upon Main, Germany.